With the Eight of Swords, the suit enters Hod, the realm of intellect and logic, and one should think how happy the Swords must be now that they are 'amongst fellows'. But Hod is more the structure of mind, while the Swords are the freedom of mind - conflicts are pre-programmed. 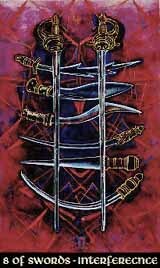 Further, the Eight of Swords reveal the nature of the suit regarding its tendency of analysing and considering everything, digging out a counter-argument for any argument there is, quickly recognizing any limitation and conclusion that in the end means the interference in the own reasoning. Only blessing stupidity can be selfsecure enough to believe that the own thought is the only truth - the Swords cannot. In another aspect, the Eight of Swords can talk of the restlessness of mind, of thoughts bursting out uncontrolled and unproductive, of nervous brooding and confused rumination.